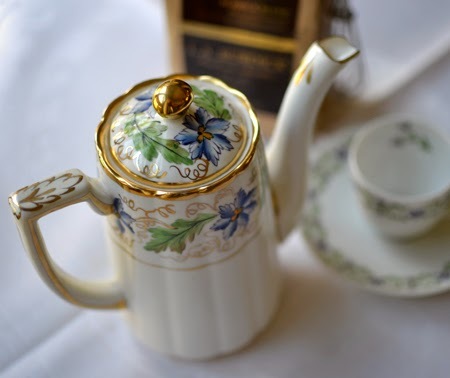 Two molinillos for Mexican hot chocolate - a new one from Yiselle, an antique one from Bunny. If your answer is, 'I do! ', keep reading. 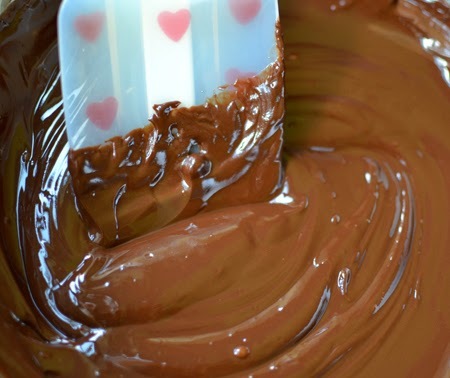 If your answer is, 'Someone I love loves chocolate!' - keep reading and make them this cake. A large pan for a big chocolate bar - a gift from Michael. If your answer is, 'I don't, and neither does anyone I know," here are my thoughts: First, we chocolate lovers thank you for leaving more for us and, second, we think you are hanging with the wrong crowd. A beautiful German chocolate pot from Sue. 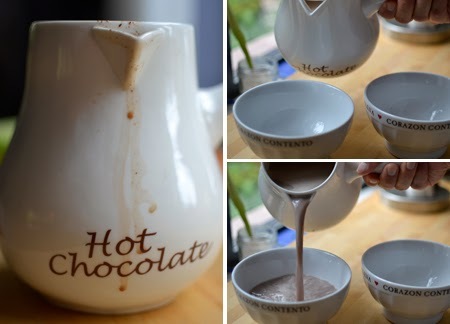 As many of you know, I begin each day - rain or shine, cold or hot - with a big bowl of steaming cocoa. It is filling, low fat (because I make it with nonfat milk), and always comforting. An antique advertisement from Michael. 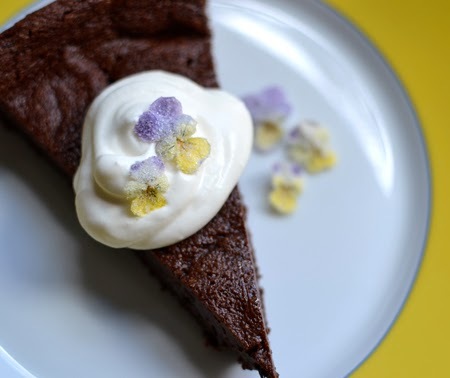 You probably also know that I enjoy chocolate desserts - remember this Mendiant Tart? Or these little Chocolate Soufflés? Or perhaps this Cœur à la Crème au Chocolat? Or even these simple mini Chocolate Tarts? 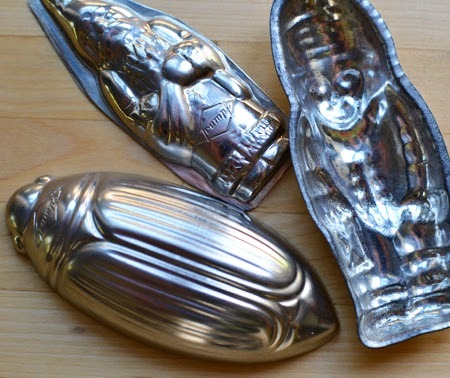 Two chocolate molds from Michael, and one from Lois. I used to consider myself a collector of cocoas. At one time, I had 27 different cocoas from around the world - from places like Morocco, Kenya, Bolivia, and Japan -- as well as from places one would expect: the Netherlands, Germany, France, Belgium, and Italy. A chocolat drinking bowl from Donna and Pat. For eating and fine baking, my favorite chocolate will always be Byrne & Carlson. I met Ellen Byrne and Chris Carlson just after they opened their chocolate shop in Portsmouth, New Hampshire, in 1999. Aside from our mutual interest in chocolate, we discovered that Mark and I had a lot in common with them - museum work, gardening, cooking, travel, and more. If never their largest customer, I became one of their most ardent ones. 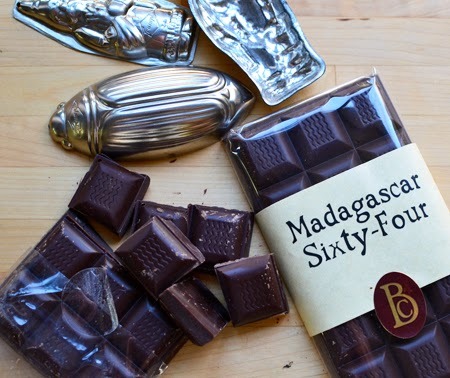 No matter what I am baking, Byrne & Carlson have the perfect chocolate for me, ranging from 54% to 85% cacao. For today's cake, I used their Madagascar 64, with its subtle orange overtone, because of its balance of cocoa and milk solids. I find that if you use chocolate that is even a little darker, the cake turns out dry and has an almost unpleasant texture on the tongue. Aside from their bars, they make all sorts of individual chocolates (my favorite is their 'muscadine' - it is so creamy and buttery!) and decorative bars (mendiant bars, pansy bars, and nut bars). They do ship, and they put a great deal of love and care into their packaging. If, like me, you live someplace really hot, they will want to wait and ship when the weather is cooler. Definitely check out their website: Byrne & Carlson. 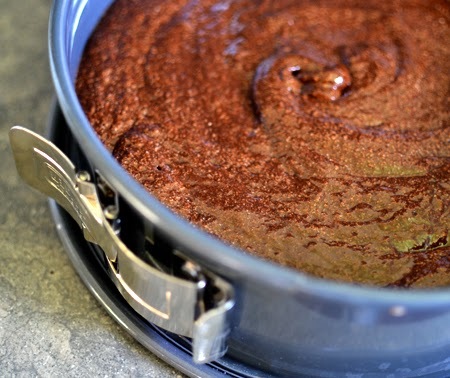 In the meantime, you should make this cake for yourself. I wasn't kidding when I said it was simple - three ingredients (and a pinch of salt)! Chocolate, butter, and eggs. 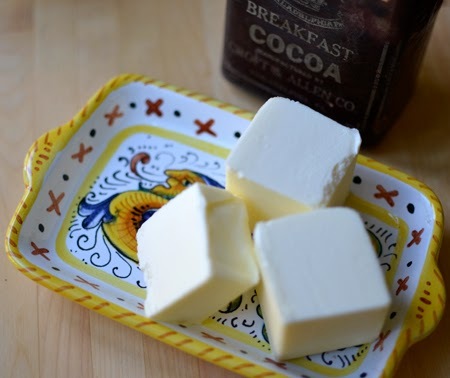 Always use the best butter and eggs to go with the best chocolate - it will make a difference in your cake, both in flavor and texture. And don't forget to share it with someone you love! Preheat the oven to 375°F. Generously butter a 9-inch springform pan. 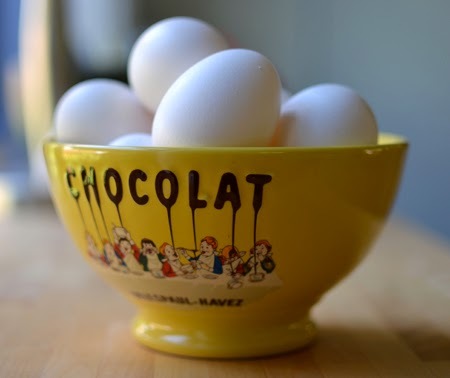 In a large metal bowl set over simmering water, melt the butter and chocolate together until smooth. Remove from the heat and stir in a pinch of salt. Let cool. 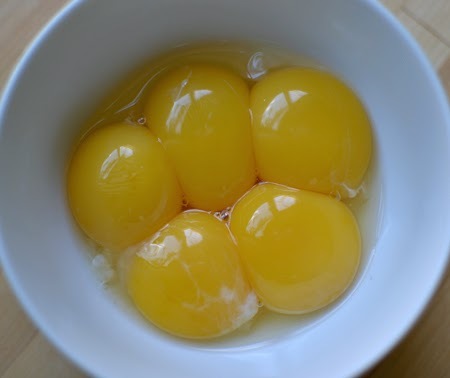 Separate eggs putting the whites into the bowl of a stand mixer (or other large mixing bowl) and the yolks into a small bowl. Stir the yolks to blend, them stir into the cooled chocolate. 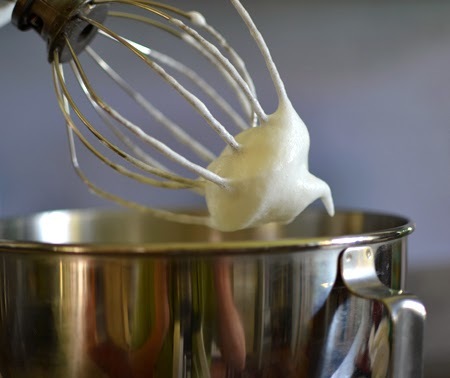 Beat the whites with the whisk attachment (or hand-held mixer) until stiff. Add a third of the beaten whites to the chocolate and stir to lighten the batter. Gently fold on remaining white and pour into prepared pan. Bake for 12-13 minutes. Remove from oven - the center should be jiggly. Let cool 10 minutes. The sides should have shrunk from the edges a bit. Now is a good time to run a thin-bladed knife or spatula around the edges to loosen. Let cool completely in pan. 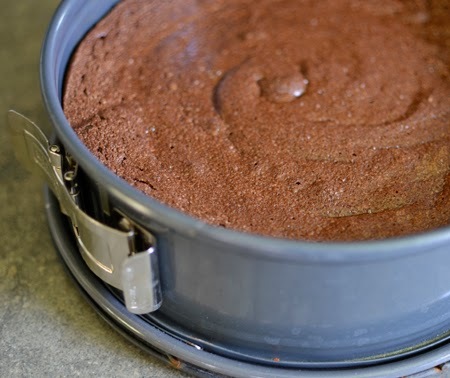 Remove the outer ring from the springform pan, and slice into small wedges. 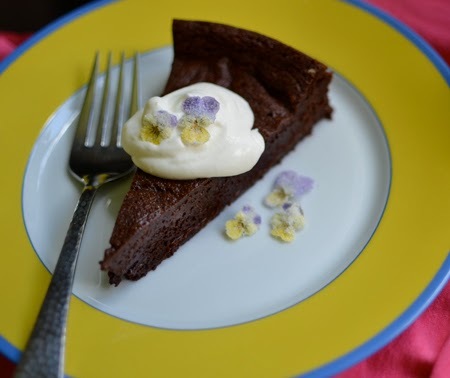 Serve with a small dollop of whipped cream and crystallized flowers, if desired. You can learn how to crystallize flowers HERE. David, thank you for the lovely tour of all your carefully collected, chocolate related items. I am quite impressed, one collectible is more beautiful than the next. If I I happen to find a yellow Chocomel mug in the Netherlands, I shall buy it for you! Your collection reminds me a bit of my coffee related things that fill some of my shelfs. And we do love chocolate too and this very pretty Chocolate Truffle Cake of yours would certainly be a huge hit at our house. What a lovely post, with fabulous pictures and a wonderful recipe! Thanks for sharing! Liebe Grüße aus Bonn von uns allen! Glad you enjoyed the tour, Andrea! So many fun things - and fun to share them and the recipe with you! I love your collection of cocoas and cool chocolate paraphenalia! I think chocolate would be a great thing to collect! 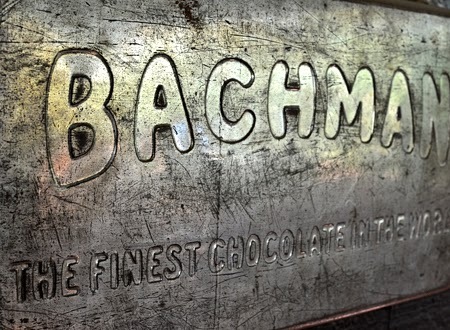 I remember my father, whenever he went to Amsterdam, or had a layover, he would buy us these huge bars of chocolate. They were so good! This cake looks amazing, and I see it's gluten free. I am going GF and not looking forward to giving up cakes. This I can make and enjoy! Thanks David! Thanks you, Nazneen - I am glad you enjoyed the post but am sad for you that you need to go GF! But, life could be a lot worse - you can still have chocolate! I have some other really good GF desserts that I will send you by email if you want. When I was in high school, after school I'd sometimes walk up to the library on the town square to do research for a paper. If the weather was fine, I'd enjoy the three-mile amble home, but if unpleasant -- and it often was -- I'd take the city bus. This required waiting in front of a news stand that carried Van Houten chocolate bars. 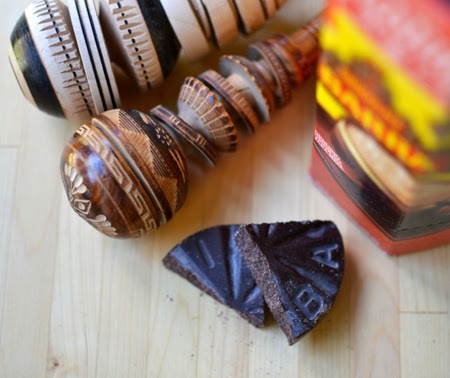 They were an expensive and infrequent treat, but through them I was introduced to dark chocolate, orange-flavored chocolate, and mint-flavored chocolate, all virtually unknown in a small New England town nearly 50 years ago. Their sleek white wrappers, with the Art Deco lettering (in green, orange or dark blue, depending on the flavor, with a stripe of gold), shone in elegant calm amid the lurid clutter of other candies, and that's what first caught my eye. Thanks! I remember those Van Houten bars, too... and their cocoa was a favorite of mine, as well. I LOVE chocolate. And I can't relate when someone doesn't. My mom, a chocoholic through and through, would absolutely love this cake! Maybe Mom should get this for a special treat, Valentina! I used to have a whole set of those chocolate bowls but they were chipped from daily use, so I only brought the one good one to Tucson! Glad you liked the post, Colette! What a fun thing to collect! Your cake is just beautiful & I love the sugared pansies. You are far more of a chocolate connoisseur than I! Well, Susan, since I have never had coffee or tea and only drink cocoa each morning, I feel that I need to know my chocolate (or at least my cocoa powders) pretty well! Our little Johnny Jump Ups are blooming nicely - probably time to crystallize another batch! Love every part of this post. You definitely have a gorgeous collection of chocolate-related kitchen items... it seems like your friends have caught on to your cocoa addiction ;) Love the beautiful crystallised flowers. They definitely raise the bar on this already impressive chocolate cake! I have no idea as to whether I could find Byrne & Carlson here in Australia but I'll have a hunt around their website for extra details. Thanks for the tip! Laura - I don't think B&C ship across the pond yet, so I think you can just use your favorite chocolate when you make this! It is fun to have a collection of cocoabilia! I wish you lived around the corner, too! It would be fun to start our days together with cocoa, Paula! Glad you like the cake- simple is best! What a lovely blog you have here... how do I follow you on the various platforms? Hello, Lizzy! Thanks for popping in to visit, and thank you for your kind words about Cocoa & Lavender - I would love to have you follow me. On the blog on the right side there are three ways to follow: by email subscription (I post once a week), or via RSS feed. If you click there there are three main options and then a drop down with additional options. I am also on Facebook: https://www.facebook.com/cocoaandlavender. Let me know if there are any problems! Have a great day! Chère Casserole - thank you so much! David - This looks amazing - all of the things we love! Can I make it a week ahead and freeze it? Does it really only back for 12 to 13 minutes? Thought I should make sure as that seems like a very short time to me! It really, really does only cook 12-13 minutes! Make sure it cools fully before serving, though. I am actually teaching this cake in a "HeartBakers Valentine Class" this week. So simple and so good!